EAA Vintage Aircraft Association > av2013 > av2013 Field Updates > Sunday, July 28th – Over 300 Vintage Volunteers working for you! Sunday, July 28th – Over 300 Vintage Volunteers working for you! 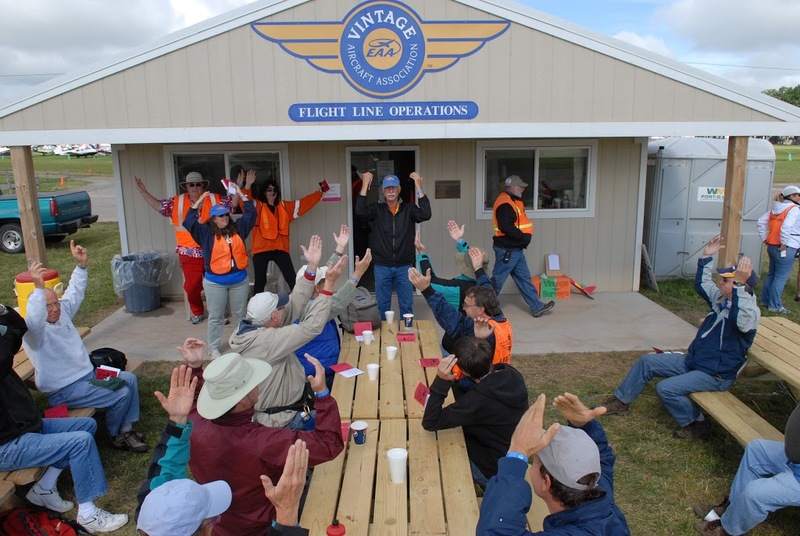 As of noon today (Sunday) 302 Vintage Volunteers have registered and are helping other Vintage members and guests enjoy AirVenture 2013. So far our Vintage Volunteers represent 37 states, two Canadian provinces, Denmark and New Zealand. UPDATE II 5:30 pm – Last update of the day. 347 volunteers and now 39 states. UPDATE 4:00 pm – Just update volunteer registration and we now have 323 volunteers including three from Switzerland. Weather has been chilly and overcast with gusty winds, so arrivals have been slower than usual. But as you can see from the photo gallery we already have many unique planes and are ready for a spectacular convention opening tomorrow. In this photo some of our flight line volunteers review hand signals used to direct pilots taxiing to their tiedown area.